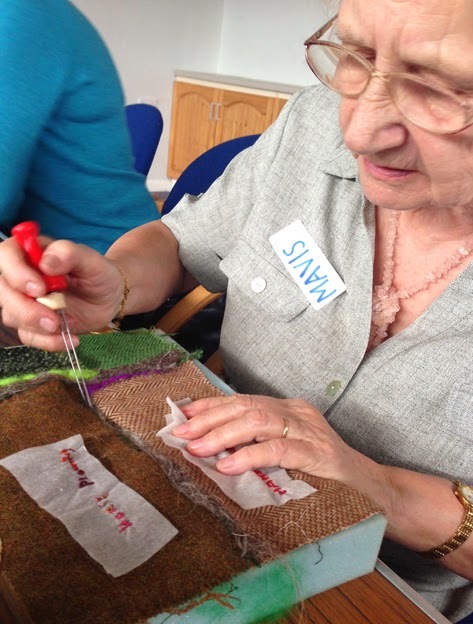 Yesterday my afternoon was spent with the Bakewell Memory Cafe, run by the Alzheimer's Society, with the project stitching the wars. 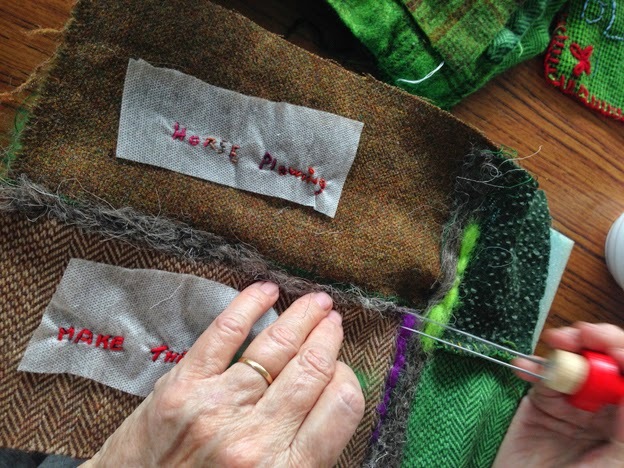 We spent the afternoon reminiscing, tea drinking, embroidering and needle felting. "My father fought in the 1st and 2nd World War, won the military medal in the 1st World War, aged 18 years, he was gassed and wounded, 3 of them where in a bunker, both privates got the Military Medal, the Sergeant got the Victoria Cross. An enemy pill box was causing all sorts of problems, they put it out of action. Then he went on to fight in the 2nd World War. He served in India between times. When the recession came between the wars in the 20s a lot of places laid of men. Rather than being out of work, he thought he had to provide for my wife and son, so joined up again. It was ‘matter of fact’, either you go on with it, or went under. He was injured in the 2nd World War as well. It was very worrying for my mother when she got a telegram saying he was missing in action. You had to get on, there was no room for sentiment, plenty of tears though. On the way across to Dunkirk, the big exodus, the little boats coming from England to take the men- my dad had been wounded, and was in an ambulance. It got blown up, all of them thrown out of the ambulance, my dad was unconscious lying in a ditch. The stinging nettles saved his life- he came round because they were stinging his face. When I walked past him in his hospital bed, I didn’t recognise him, his hair had turned white with the shock. Thanks again to Becky and Ron for hosting a relaxed and productive session and to volunteers Allison and Sue for joining in so enthusiastically with the embroidery.